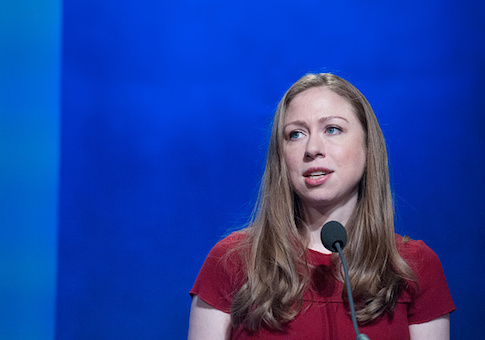 Former First Daughter Chelsea Clinton said in a new interview she would consider running for office if she felt the position "matched" her "talents." After saying in August that a run for office was a "definite maybe," she said ahead of an appearance to promote a new children's book that she could see herself running if the right opportunity arose. "I think if someone were to step down or retire and I thought I could do a good job and it matched my talents, I’d have to think if it’s the right choice for me," Clinton said in an interview with the Westchester Journal News. "I don’t have any plans to run for office, but it is something I think about as I hope every young person thinks about it," she added. "If you care about what’s happening in the world, you have to care about running for and holding elected office. I hope it’s a question that we ask ourselves. For me, I live in a neighborhood in the city and in a state where I feel my family, and what I hope for the world, is well-represented." Clinton said she disagrees "deeply with President Trump on, I think, everything practically." Clinton, who serves as vice chair of the Clinton Foundation, has been outspoken on several progressive issues, including on abortion during the Supreme Court fight over then-nominee Brett Kavanaugh. Her new book Start Now! You Can Make a Difference is aimed at children aged 7-10 and "tackles issues of health, hunger, climate change, endangered species, bullying and talks about what children can do to make a difference." She's spoken out often against bullying and defended Trump's young son, Barron, from online critics. She also called on Democrats to condemn radical Nation of Islam leader Louis Farrakhan over his outlandish statements. The daughter of Former President Bill Clinton and 2016 Democratic nominee Hillary Clinton, she enjoys widespread name recognition but has no personal office-holding experience. She worked at NBC News from 2011 to 2014 for a reported $600,000 salary, often doing feel-good segments for "Nightly News." In one segment, she interviewed the Geico Gecko mascot. This entry was posted in Politics and tagged Bill Clinton, Chelsea Clinton, Hillary Clinton, NBC News. Bookmark the permalink.